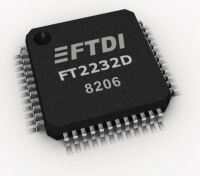 The FT2232D is the 3rd generation of FTDI's popular USB UART/FIFO IC. The FT2232D is an updated version of the FT2232C and its lead free version, the FT2232L. Please note that the FT2232D is not an new generation of device. The FT2232D is lead free and pin compatible with the original FT2232C and FT2232L devices. All the original device features are supported with some additional features available including a CPU-style FIFO mode and an extended operating temperature range. This device features two multi-purpose UART/FIFO controllers which can be configured individually in several different modes. As well as a UART interface, a FIFO interface and the Bit-Bang IO mode of the 2nd generation FT232B and FT245B devices, the FT2232D offers a variety of additional new modes of operation including a Multi-Protocol Synchronous Serial Engine (MPSSE) interface which is designed specifically for synchronous serial protocols such as I2C, JTAG and SPI bus. Cellular and cordless phone USB data transfer cables and interfaces.